Observation - Euphorbia woodlands - Global. 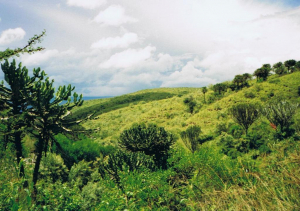 Description: Candelabra trees (same genus as our little spurges) sticking out above the lower scrub and grassland on a rocky hillside near the Hell's Gate National Park. Candelabra trees (same genus as our little spurges) sticking out above the lower scrub and grassland on a rocky hillside near the Hell's Gate National Park.